Go to Sleep, Jessie! is a children’s picture book, written by Libby Gleeson, illustrated by Freya Blackwood and published by Little Hare, (Hardie Grant Egmont) 2014. It’s been shortlisted by the Children's Book Council of Australia in the Early Childhood awards, and I can certainly see why. Jessie is a baby who cries and won’t go to sleep, much to the disgust of her big sister, Jo, with whom she shares a room. Kids with babies at home will certainly relate to wanting a crying little one to stop. Parents will relate too, to the way Mum and Dad try what they can to get Jessie to sleep. Dad drives around and around the block, and brings back a drowsy baby, but Jessie’s eyes pop open again. Will nothing make this little one fall asleep? Gleeson tells a deceptively simple tale, but one so richly invested with emotion. We pick up through the dialogue and illustration that Jo’s annoyance is escalating, and wonder if this child will ever quit! I loved Blackwood’s illustrations with their contrasting palette of colours. The way she portrays the parents is superb, and will evoke fellow-feeling in any mum or dad. There is also lots of humour in the illustrations, a contrast to the tension of the text. 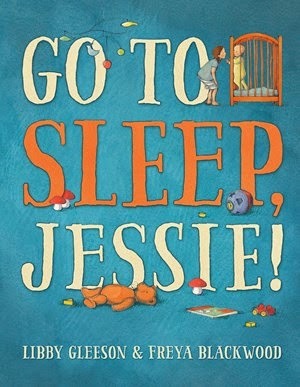 I’ve just read Go to Sleep, Jessie! aloud to a group of children aged from 18 months to 4. It doesn’t happen very often with this group, but every one of those kids was immersed and emotionally invested in this story. The two elder boys were caught up in the tension, and whispered to me before each page turn that they thought the baby was about to cry yet again. The toddlers understood what was going on, and watched intently. The babies took notice as they rolled around, especially when I did my impression of a child-like wail. Even the parents in the library today were all focussed on the story, and smiling ruefully. This book is a HIT to read aloud. My advice though is not to do the role play we followed up with - pretending to be crying babies was not something the kids wanted to relinquish in time for our second story! Do grab this excellent children’s picture book if you want a book the majority of kids will relate to, and one with constant tension to keep children’s interest. I loved the way the problem of a crying baby was solved by her big sister. I believe the book is also perfect for discussions with older kids, especially those who may have to share space and belongings with a younger sibling. There are Teacher Notes to accompany the book. Go to Sleep, Jessie! would make a fine book to share with kids during Children's Book Week in August. Grab some more ideas for Book Week in Children’s Book Week Activities, 2015, Children’s Book Week Challenges for Kids 2015, Children’s Book Week 2015 - Ideas for Performance, Children’s Book Week - Ideas for Display, and Guest School Visits during Children’s Book Week.